It’s that “magic dose of mischief” that we celebrate with Greenish Cat on Pinkish Pot and Pinkish Cat on Greenish Pot. This pair fully embodies the Seussian tenets of fun, curiosity, and irreverence. They are a visual metaphor for The Secret Art of Dr. Seuss Collection as a whole, taking us behind the scenes of Ted’s artistic life and into his world of grown-up play with a bold, direct, and charming use of The Cat. For all these reasons, this pair presents an iconic Seussian twosome. As only Dr. Seuss could, he veered far afield of convention and seated each cat, as the French would say, on a porcelain “pot de chamber”—a necessity which served mankind well for 2,500 years. Then, in an ever so slight move towards modesty, Ted be-ruffled his cats, subtly suggesting some form of dress. We can almost see Ted chuckling to himself as he drew this “privy” pair—his love affair with fun and cheekiness entirely intact. Because Ted considered the paintings he did for his own pleasure at night to be private, we have few recorded comments from him regarding their existence. 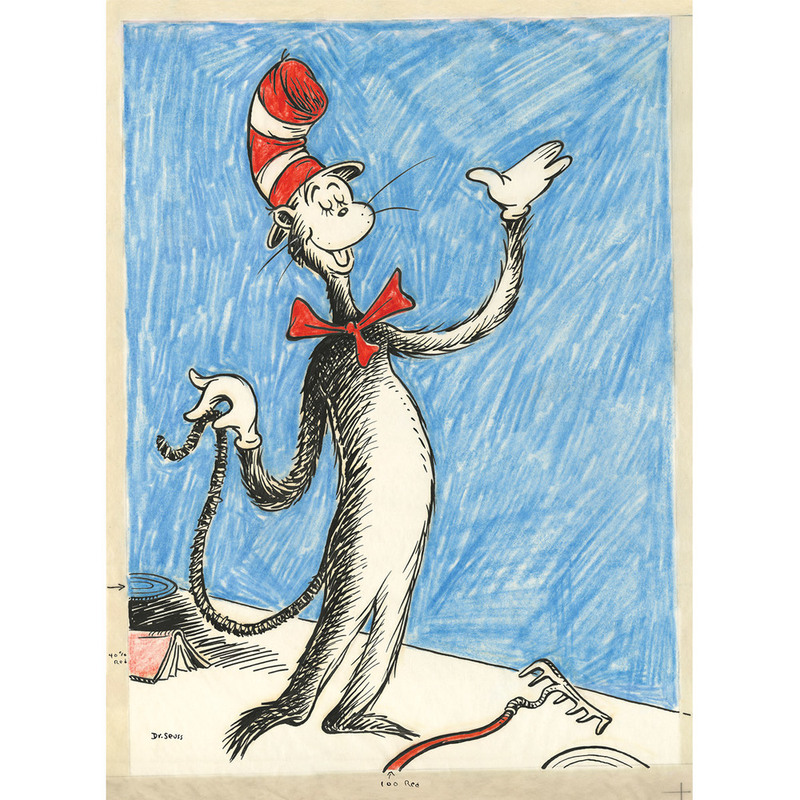 We do know that Ted created 81 known “Midnight Paintings,” all of which appear in, The Cat Behind the Hat — 30 of these being “feline inspired.” Since its inception in 1997, cat-related images have unquestionably become the most iconic and sought-after artworks from the Art of Dr. Seuss Collection.